For two Splitcoaststampers' challenges this week, this card features Pretty in Pink, Dusty Durango (some Really Rust) and Creamy Caramel as well as the sketch from the SC273 challenge. It also goes in my Operation Write Home box. The flower contains all the required colors with SU! watercolor markers and a blender pen. The dessert option was leaves so I used the Leaf Print unmounted wheel again. Think I'm getting addicted to this one. I stamped Dusty Durango ink on the same cardstock, but only one row. 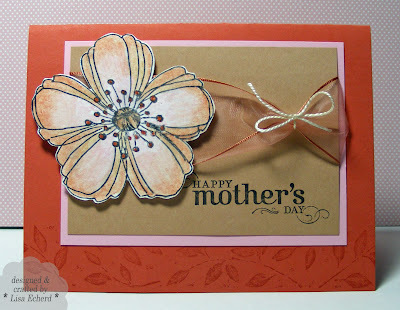 Yesterday's card, I stamped this image all over and it was a bit busy. After I got nearly done, I realized I'd left out a layer so I put in the ribbon in place of paper next to the flower. These sheer ribbons from the floral department are great subtle additions. Ingredients: Stamps: by Stampendous; Leaf print wheel and All Holidays (greeting) by Stampin' Up! Cardstock in colors of challenge listed above - all by SU! First visit to your blog (from SCS) and I'll definitely be back. You have a nice style! I tried posting a card on SCS, but it only came up in my gallery. Can you tell me how to post it on the gallery for the stamp used??? When uploading to Splitcoaststampers, the first drop down option you have is the category with the default option Member Galleries. Click on the down arrow and scroll down until you see the alphabetical list of all the Stampin’ Up! stamp sets and wheels. Just pick one and that is where your card will end up. Good luck and thanks for visiting! 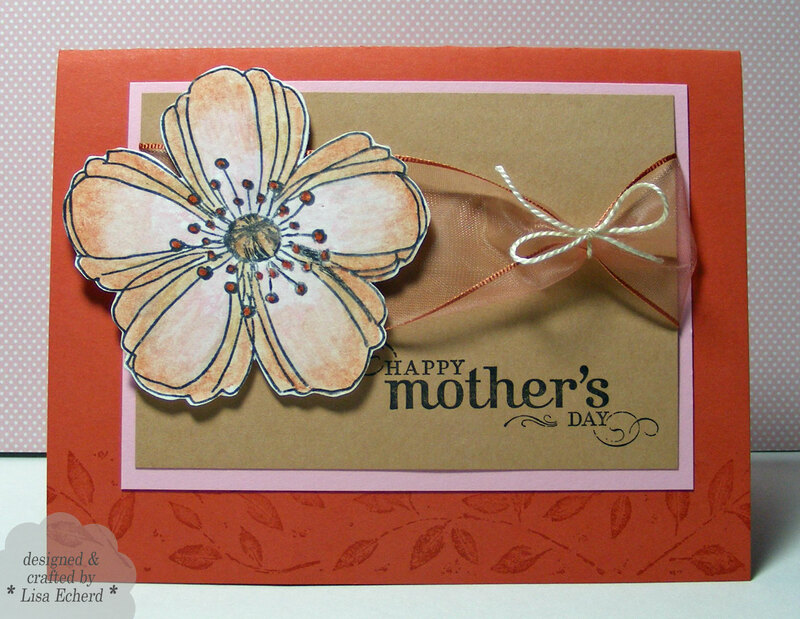 OOh... when posting to Splitcoast be sure to post this beautiful card in the Stampendous gallery, too! You've done a wonderful job here, and we'd love to share your gorgeous Fresh Bloom card with everyone!